My childhood was that of a child imprisoned inside his house. My mom is from Rio, my dad from Natal in the northeast, and my parents never liked for me to stay on the street because of the language, the slang, the songs, those things. Because of that I had to learn many things outside of Maré, when I met other people and began to mature, to lose my innocence. I lived in Nova Holanda, then in Baixa do Sapateiro, and I lived for a year in Barra da Tijuca, an upper-middle-class area. 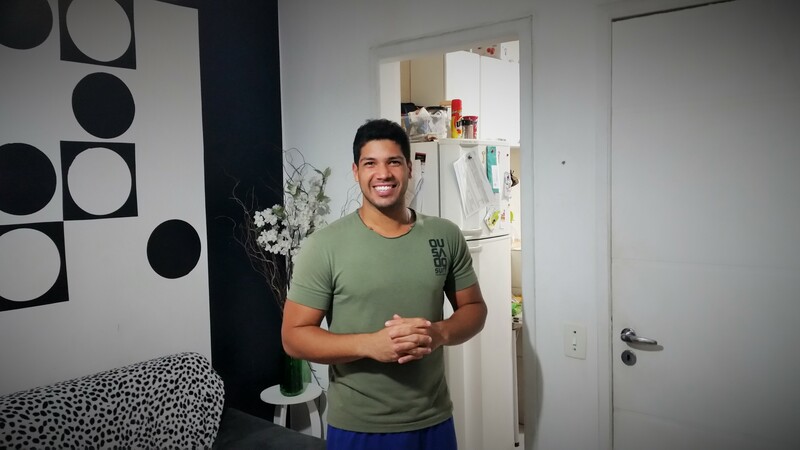 It was a better quality of life there, but a lot more expensive; it didn’t work out and we had to come back here, and now I’ve been living in Morro do Timbau for four years. I spent eight years in the navy working with administration and strategy. After five years I was promoted to sergeant, and there I was able to connect with various commanders in the Armed Forces and help in various ways. But I eventually decided that I didn’t want to stay there any longer because of the travel we had to do to various states; if I were in the Armed Forces now I wouldn’t be able to study at university, be with my family, everything else. So for that reason I left, and in the future I intend to use the things I learned there and what I’m learning now at university to open my own business, because that’s a better way to live. I stayed in the Navy through 2007, and in 2006 one of my friends invited me to work selling acai on the beach on the weekends. I’ve been working there since. Generally I arrive at noon and work until I run out of bowls, about 140, 200, 250 depending on the season. It’s hard work to walk all day on the hot sand and scream, “acai! acai!” but I like it because we end up learning about other cultures. “Hi, you’d like acai? Yes! You like honey? How much? 12? 15?” [laughs]. I’ve been doing a diet precisely for my work on the beach, because our appearance there is also a question of art and quality. People generally have the idea that those who work on the beach are dirty and stupid, that they’re there because they’ve lost their way. And so when those people see someone who’s in shape they’re surprised and you end up selling your products well. 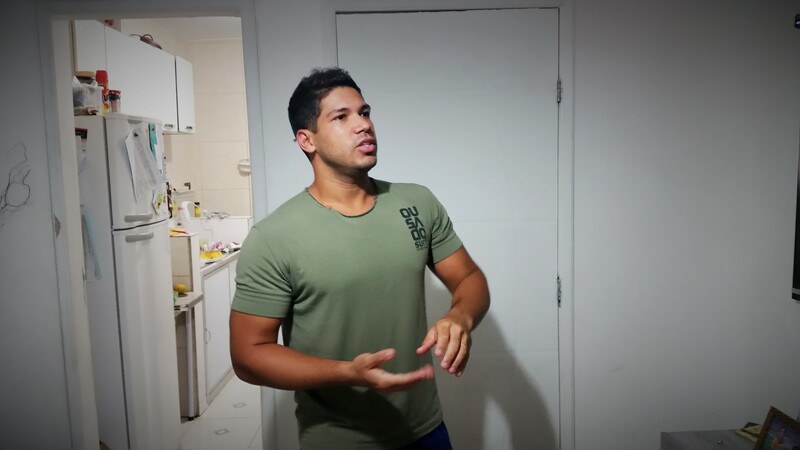 People don’t see this profession as one that gives a good salary, but it’s a lot better than a job in which you’re waking up at 6 a.m., arriving home at 7 p.m., tired, and at the end of the month making two thousand reais. On the beach, if I sell 140 bowls for 10 reais, I can make over a thousand reais in one day. Unfortunately, to live in a society like Brazil’s, you either have to steal or you have to work a life of multiple jobs to have a better quality of life. It’s really difficult to put your kids in a public school; the good schools here are all private and you have to pay close to 2, 3 thousand reais per student per month. This is the Brazil that prepares young people for the future, burros being lead by other burros, so that the ruling class continues in command. Brazil lives on appearances, it lives with a makeup for people who live outside of it – the Olympics, the World Cup – and all of us in Brazil know that it’s corrupt, but the government doesn’t give us the tools to question it. Because the truth is that when we don’t study, when we don’t have that knowledge, we don’t look after our rights as consumers or with the police; when we study we gain new perspectives that make us chase after our goals because we have the tools to do so. What I want now is the impeachment of Dilma. I really want the armed forces to take power, because the bandidos would actually be scared of the armed forces, like during the 1960s, 1970s when there was a military dictatorship. It’s the best thing that can happen, because people would manage to live with a certain quality of life. The military doesn’t have extra hours; I, as your sargeant, am going to tell you, “I want you to construct this sidewalk,” and it’s going to be done. The military does steal, but if they discover the corruption it’s a lot worse for someone in the military, with jail time and everything else. In Brazil nowadays, politicians announce a project and it never gets finished; he can steal millions of dollars and put them in the Cayman Islands, and nothing will happen. It’s true that in a dictatorship you have torture, but tell me, what place doesn’t have torture? If you really go and read the history and compare it with today, you’ll find that people actually died a lot less during the dictatorship. Nowadays the people who die are all innocent – a child, a father – and the bandido will be let out of jail and continue killing. If you get robbed and call the police, the police won’t do anything because they’re also on the bandido’s payroll; the next day he’ll be there to take your things again. That’s the society that we live in, where the quality of life has spiraled, we’ve lost our moral values, and we can’t do anything about it. And so I prefer a dictatorship, because if you’re a bandido you’d know that you have no excuses with the military. I’m certain that the homicide rate would go down, along with the number of robberies. It was a lot better to have a dead bandido during the dictatorship than to let him keep killing innocent fathers today. The truth is that I’ve stopped being patriotic, a patriot is that person who likes the place he lives. It’s not that I hate Brazil – Brazil is really beautiful, there’s always nice weather; you can go to Copacabana and see the stars, drink coconut water; there’s the sea, the breeze. The problem is that with all the problems we have, it ends up wearing you out as if it were a marriage; after seeing so much tragedy, so much corruption, you end up not being able to take it any more. But we have to learn to live with this situation and try to change in some way even if we can’t change the system itself. You can look to study hard, earn a good salary and go to other places to live with your family. My wife and I became parents when we were very young – I was 21, she was 20 – and we had some problems at the beginning, but we ended up overcoming those difficulties. I’m 26 years old now, and thanks to Jesus we’ve managed to have a house, a car and two kids who study at private school, who have snacks every day to eat. When I’m 28, I’m going to have a degree in administration, and after that the plan is to pass a public service exam to make a good salary to be able to leave here. I don’t want to live in riches, have a mountain of money – I want to live well, with quality, to give a better quality of life to my kids and my wife. And I think that that idea that we can only live in Brazil is a lie. Unfortunately I was born in Brazil, but that doesn’t mean that I have to live in Brazil. I can live anywhere in the world. I have to look for what’s best for me. Douglas is quite the entrepreneur, a real self-made man. I admire his ambition. Even if he’s exaggerating, it’s pretty grim. We hear about these things but the story is much more compellng when told in the first person. The pictures also tell a lot about who this is and how he lives–the attractive, sanitized surface masking the not-so-hidden ugliness. The willingness to embrace, as the lesser of two evils, a regime that tortures really says it all. Very moving, interesting, also funny. I look forward to the next, Sascha.